Are serums and moisturising creams interchangeable, and do they produce the same hydrating effect on your skin? The truth is, combining the effects of creams and serums is absolutely essential to achieve luscious and radiant skin. Serums usually have a formulation of a fluid base with a lightweight, liquid consistency. Their main special feature is the high concentration of parts per millilitre, with a great tissue absorption capacity. Which is to say, they have a very high concentration of active ingredients and are more effective in delivering nutrients and other good stuff to your skin. Even when used sparingly, the serum is capable of giving direct and deep nutrition to the lower stratum corneum of the skin. High concentration of bio-elements and active ingredients. Main function to supply nutrients, vitamins and other active ingredients to the skin instead of purely hydration. It has a synergistic boosting effect when it is used before the application of a facial cream. Creams, on the other hand, have a hydrating function. This is due to the higher concentration of fat components and a lower concentration of watery components. Even though they have similar active ingredients and both have beneficial effects on the skin, they are very different products. Therefore, a serum is used to target certain specific skin concerns, while creams are used to protect and hydrate the skin. How do we use serums and creams? We recommend a daily skincare routine that includes both a serum and a cream to see drastic positive effects on your skin. Adding ampoules to your skincare routine would ensure that both moisture levels and specific skincare concerns such as dark spots, dull skin, rough skin and acne, are taken care of. Apply it to the key areas of the face: forehead, chin, cheeks and nose, rubbing it in a horizontal manner, from inside to outside. Apply it after properly cleaning the skin and then always couple it with a cream or an emulsion. Apply it day and night. Look at the specifications of the serum that you are using. 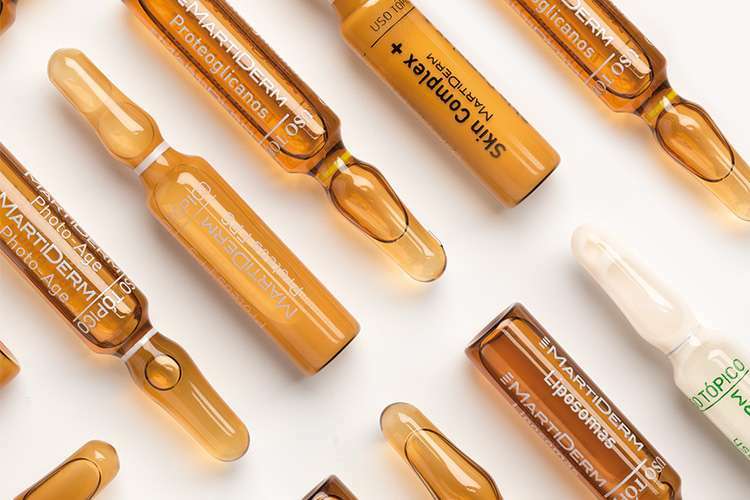 MartiDerm’s award winning ampoule formulations cater to every skin type and skin concern, with the highest quality and concentration of active ingredients that absorb into the skin and gives it instant suppleness and visible, long-lasting effects. The ampoule form also prevents any form of oxidation and keeps the product quality at the highest level. This is extremely important to maintain the integrity of the active ingredients contained in the serums so that they stay effective for a long time. Try out our full range of signature ampoules today. Simply spend $80 and above and FREE SHIPPING plus an assortment of 5 FREE ampoules, so that you can see which ones suit your need the best. View the full range of ampoules HERE.